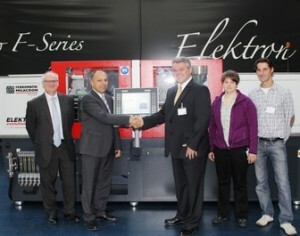 Two Elektra 50 all electric injection molding machines were presented to Offenburg University of Applied Sciences by Ferromatik Milacron. The Germany institution is in collaboration with the Italian machinery supplier to train new bloods for the plastics industry. In the university’s new “Mechanical Engineering/Materials Engineering” course, more than 100 students will be working with the Elektra 50 to learn how to set up and program a machine and also how to deploy newly developed plastics granules with special additives and fillers that enhance the service properties of the finished part. The special feature of this type of education is that the injection molding process can be set up directly on the machine, and the process parameters validated. In addition, it will be possible to verify new production technologies, such as the use of rapid prototyping for the production of mold inserts. In this way, the students will be able to work their way through the entire process chain in the development of an injection mold, from the design, via simulation and optimization, right through to the finished end product. “We are delighted to be able to support the Offenburg University of Applied Sciences in their commitment to state-of-the-art and energy-efficient technologies. This is the best way to develop the next generation of professionals for the industry,” said Gerold Schley, Managing Director of Ferromatik Milacron & Vice President of China Operations.